These were the last words I wrote for my grandmother, the woman who taught me to read at age four and coaxed my writing along. For her tombstone. 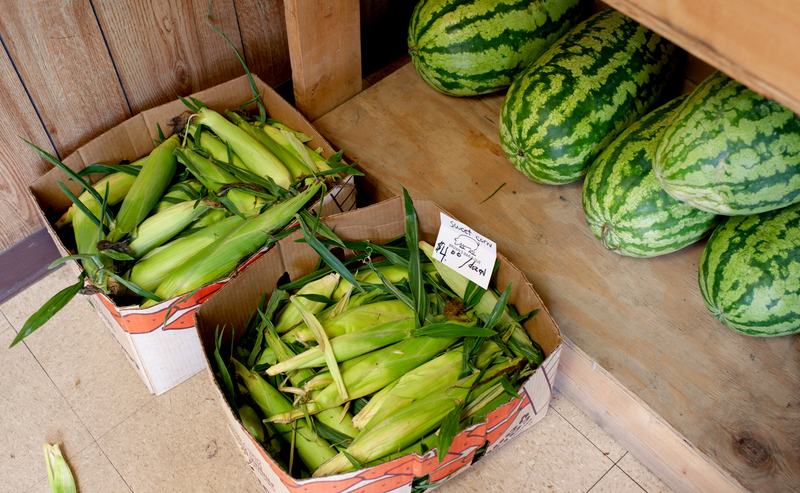 If onion, celery, and green bell pepper are the holy trinity of Southern food, corn is the sacred mother. 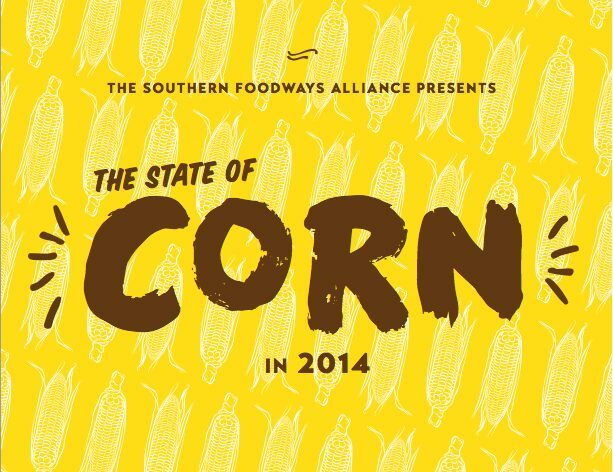 Read the SFA’s State of the Plate: The State of Corn, circa 2014. Nearly six years ago, we lost her in a car accident on the way to our annual family beach vacation. Granddaddy was driving, a fact he’ll never unburden himself from. 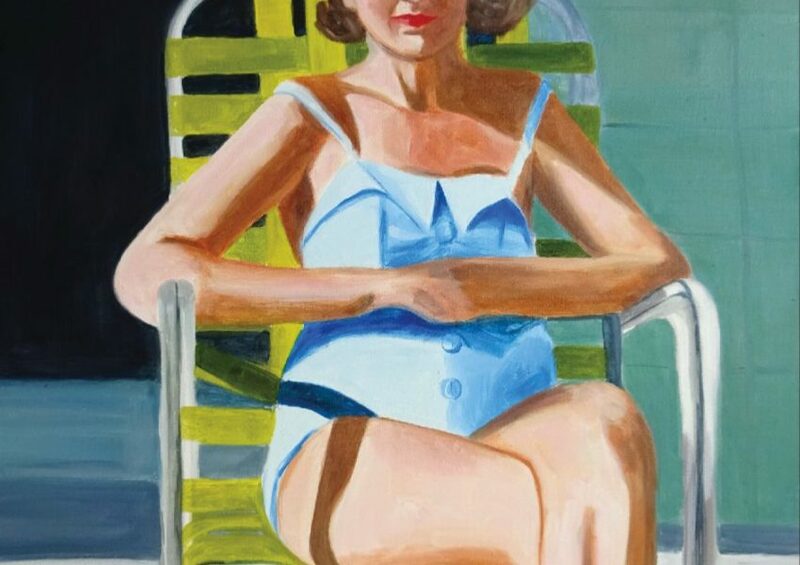 For the next year, as we took turns spending nights at the house, family members would often report seeing her, always in her purple nightgown. Last year when I had unexpected kidney surgery, I swear she sat with me and stroked my hand while I was asleep on the operating table. As I awoke, pulling away from the tug of anesthesia, I couldn’t figure out where she had gone and felt I had lost her all over again. We continue to feel her presence, though less spectrally these days. Her cooking haunts me most. Ti Ti wasn’t a great cook. (Ti Ti, pronounced tie-tie, comes from Vashti—vass-tie—which is also my middle name.) She would trot out newfangled recipes from this or that magazine for every family holiday. Dishes she’d never made before. Ninety-nine percent of the time, they were colossal failures. Holiday leftovers took on proportions as ample as a funeral spread, with family members accepting gallon-sized Ziploc bags for the ride home, all the while lightly protesting, “No, y’all will eat this. We don’t need to take any.” Thank goodness for the ham Granddaddy insisted on buying every year to supplement her feast. We continue to feel her presence, though less spectrally these days. Her cooking haunts me most. But she baked my favorite biscuits on the planet. They were cakey and dense, the top and bottom crisped by a Crisco-swathed cast iron skillet. She always flipped the biscuits halfway through cooking to make sure both sides got a smoldering kiss from the pan. And, man, could these biscuits soak up some cane syrup, poured in amber ribbons that stretched from the bottle like pulled taffy. The week following her death, our family took up camp at my grandparents’ house. We all needed to be there. We were also scared of letting Granddaddy, his ribs bruised and his being shattered from the wreck, retreat to the house alone. During that week, my cousin Jamie and I used Ti Ti’s biscuit bowl as therapy. We’d made biscuits at her side for years, the privilege of being one of her girls. But she had left no written recipe. Self-rising flour, buttermilk, and Crisco, mixed by hand. That’s all we remembered. Proportions? Tackiness? No clue. We were determined to get as close as possible to the taste memory still fresh in our minds. I bet we turned out twenty dozen biscuits that week. We made one batch somewhere in the middle that was perfect. As the daughter of a poor Mississippi Delta farmer, Ti Ti also knew her way around vegetables. That is, she knew how to cook them the way Granddaddy—who tended a garden for decades, massaging the earth every growing season—liked to eat them. She always had a simmering pot of butterbeans cooked down to nuggets of velvety paste barely contained by the thin skins. Her shining glory was creamed corn, which she called fried corn. She wouldn’t use just any corn. Her family had their own hybrid they’d cultivated for years, a starchy dent variety they called Underwood corn, the family name. 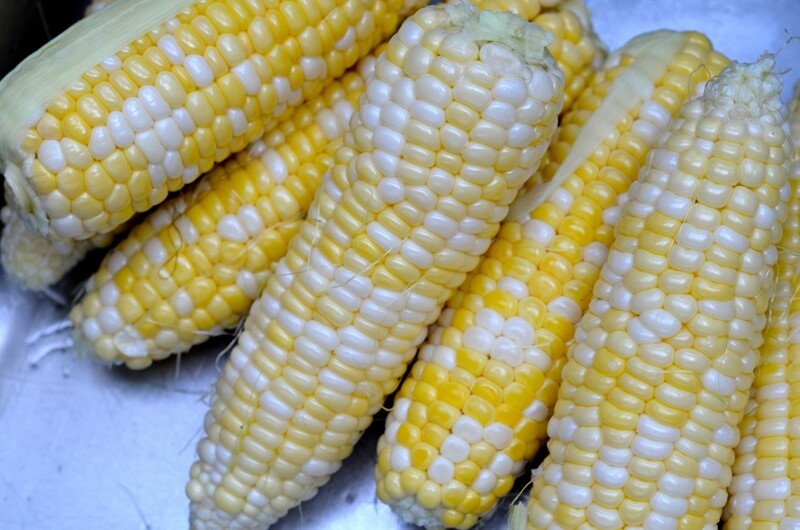 Forget the taste and mouthfeel of plump kernels bursting with sunshine. Even at its peak, Underwood corn is hard and chewy. You have to coax the cob with a sharp knife and blistering determination to yield any milk. 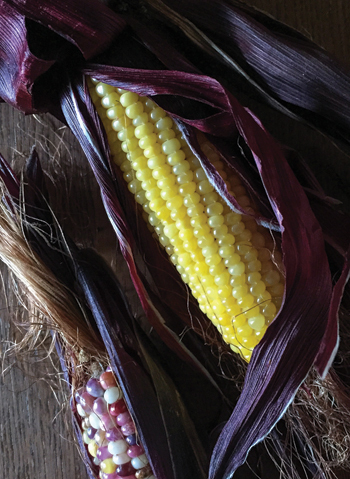 Chef Virginia Willis muses on corn as an all-American summer food and shares her recipe “Stone Ground Grits with Corn and Greens” on the SFA blog. After they married, Granddaddy planted fields of Underwood corn for Ti Ti. She would spend summer days and nights over the kitchen sink, scraping cob after cob until well past the point her hands lost their grip. She wouldn’t ever let anyone help. “I can do it myself, thank you very much,” she’d say in a singsong voice. 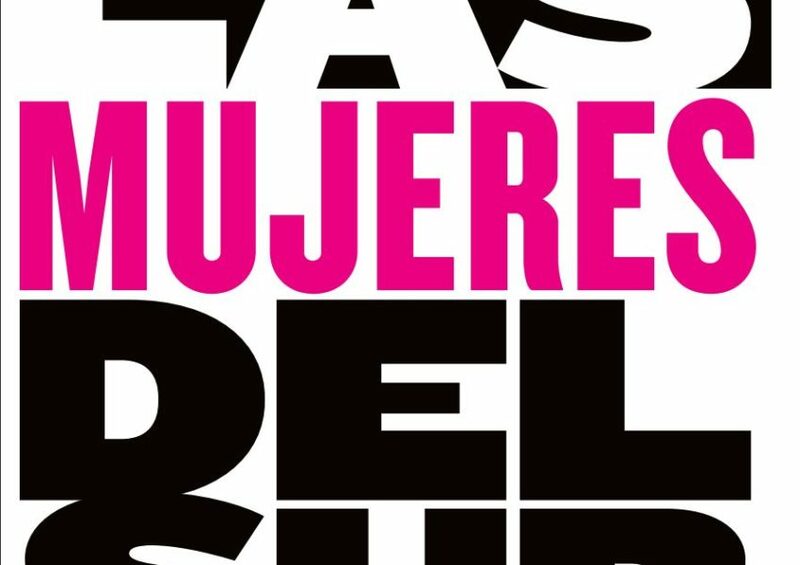 The woman was fierce. For days she’d stand at the stove, stirring enough butter and cream into the skillet to render that unbending corn supple, and tuck it in the freezer alongside the bream and crappie that she pulled from the pond. 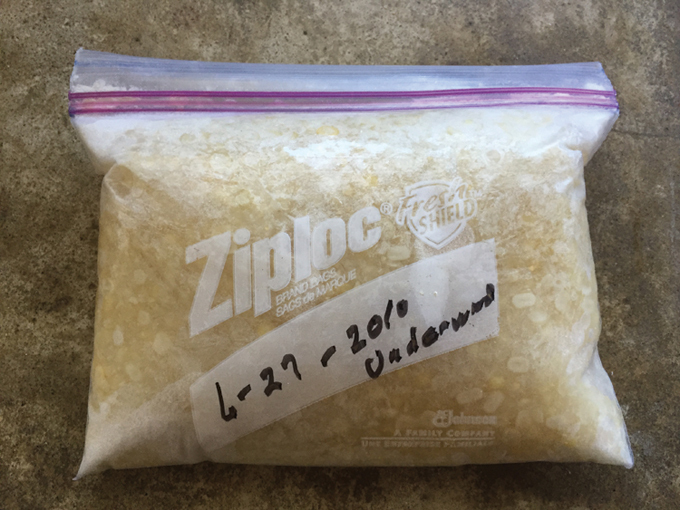 A few months ago, as I was putting ice cream away in my Birmingham home, I came across a quart-sized bag of Ti Ti’s corn. I have no clue how it got there. I don’t recall raiding Granddaddy’s deep freeze. As I looked at the Sharpie-scrawled date on it—6-27-2010: UNDERWOOD—in her unmistakable handwriting, I realized it was the last batch of fried corn she’d ever made. She’d died the next week. It was the last batch of fried corn she’d ever made. She’d died the next week. Tethered to our agrarian past with the foods that fill our tables and stock our larders, Southerners hold the land as our legacy. As words like heritage and heirloom fill menus across the country, seed savers are the modern community bank, holding memories of past meals in the Mason jar equivalent of a safety deposit box. Recipes live on, textual proof of our generational ties. My paternal grandmother, Mamaw, a master of the kitchen, generously shares her recipes for caramel cake, chocolaty “Jane Cole Cupcakes,” and chicken pie. After she’s gone, I’ll have memories of feeding the sourdough starter in her kitchen and will feel confident that I can replicate her tender loaves. Until I found that bag of frozen corn, I hadn’t realized the heady emotional pull of an actual foodstuff. My Ti Ti was gone, but if I wanted, I could eat a final bite of her home cooking. It wasn’t a recipe for creamed corn; it was her corn, made by her hands. Jennifer V. Cole will argue corn in the “Lincoln-Douglas Biscuit-Cornbread Debate” at the 2016 SFA Fall Symposium Debate. When I told friends about finding Ti Ti’s corn, they responded with stories of their own. “I have a jar of green beans that my beloved grandmother put up. If it’s up to me, it’ll be buried with me to sustain me on my journey to the sweet hereafter,” said Sheri Castle. April McGreger recalled harvesting the greens her grandfather had left in his fields shortly after his death, crying as she held the leaves he had cajoled from the soil before his departure. Food is the product of love and labor, usually in equal parts. When left behind, it reminds us that our loved ones were once very much alive. Jennifer V. Cole is a writer based in Birmingham, Alabama. At the age of six months, her Ti Ti baptized her with bourbon to help with her teething. She never lost the taste. In this Greenhouse Film by Christy Ward, Camile Persica of Livonia, Louisiana, demonstrates how to make the classic Cajun dish maque choux. When I think of family gatherings, I taste Summer Drink and see flour-dusted dough.